The US military dropped America’s most powerful non-nuclear bomb on ISIS targets in Afghanistan Thursday, the first time this type of weapon has been used in battle, according to US officials. A GBU-43/B Massive Ordnance Air Blast Bomb (MOAB), nicknamed the “mother of all bombs,” was dropped at 7:32 p.m. local time, according to four US military officials with direct knowledge of the mission. A MOAB is a 30-foot-long, 21,600-pound, GPS-guided munition. 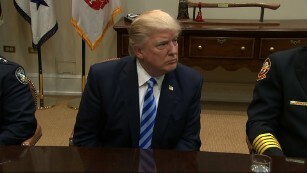 President Donald Trump called it “another successful job” later Thursday. DON’T ENCOURAGE HIM! IF HE THINKS THIS IS GOOD, YOU KNOW WHAT HE’LL DO NEXT!!! This entry was posted in defense spending, GOP, Guns, Politics, Stupid people, Terrorism by brobrubel. Bookmark the permalink.